The reaction of the UK media to the Twitter abuse of Caroline Criado-Perez following her part in a campaign to have a high profile woman on an English banknote has shone an embarrassing light on Scottish mainstream’s failure to properly act on the intimidation campaigns which raged throughout the Rangers crisis. 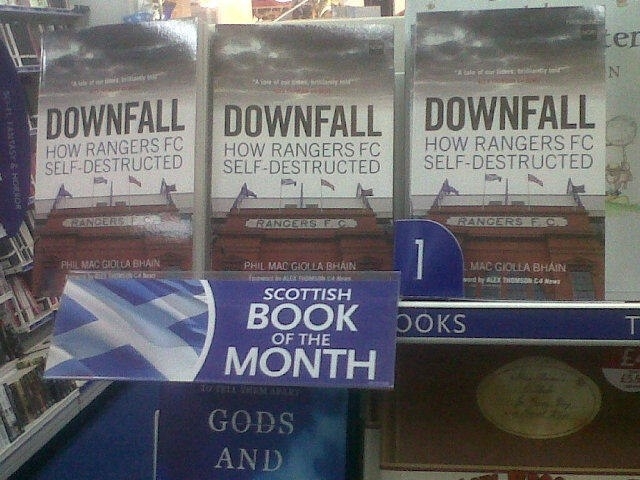 After I edited Downfall: How Rangers FC Self-Destructed by Phil Mac Giolla Bháin a year ago my name suddenly became of interest to the Crazies and I am still using the Twitter block function on a daily basis. This story of financial doom and of one of Scotland’s most ingrained social problems was one a section of this society tried to prevent being told. I’ve dealt with counter-terrorist police, appeared on Channel 4 News alongside other victims and police have advised me to keep personal information and my whereabouts private. I am by no means the only journalist or commentator living life by those rules in Scotland today. However, amid that chaos an incident last month raised me a smile: my close encounter with a Rangers troll. I arrived fashionably late at the hen party of a very dear friend to find it was very much in full swing without me. A few of the girls I knew, a few I didn’t. As I sat politely sipping a cocktail that would knock a horse out, one extremely inebriated lady plumped herself down on the couch beside me. After a few slurred words, she asked me my name. “Angela Haggerty, what’s your name?” I extended my hand. Her jaw dropped. She asked me to repeat that. Her face was like stone. “I’m your arch enemy on Twitter,” she stammered. I paused. She may have considered herself my arch enemy, but her name meant nothing to me. “Now that I’ve met you I realise what a nice person you are,” she went on, as I tried to mentally sift through the hundreds of people I’ve blocked on the social networking site. “I mean, we’re here for a hen party, it’s their night, let’s not say anything this – we can get along for a night, can’t we?” she pleaded. As she carried on trying to explain her appalling behaviour on Twitter through a drunken haze and slurred something about her job and not getting sacked, her identity finally dawned on me – she was from my home town. We were still exchanging an extended handshake through the confusion when the tirade of abusive tweets she had once sent me flooded to the forefront of my mind. Not every troll will stick in your mind, but the ones who exchange information with the Crazies about where you live and work will. Embarrassingly drunk and having knocked over a good couple of drinks since my arrival only minutes earlier, this Twitter troll looked ready to collapse by 9pm. I won’t describe the picture in its entirety, but if I had ever formed a stereotype in my mind of the trolling Crazies, the person sitting in front of me stuttering a grovelling apology was it. This Rangers troll spent the next half hour or so with her tail between her legs, occasionally blurting out yet another plea for me not to make a fuss, much to the rest of the room’s bewilderment. My troll took the welcome decision a short time later to call a taxi and go home early, much to the group’s relief as we headed out to the pub – there wasn’t a chance in hell of her getting served anywhere. After her departure the room full of inquisitive women – unusual, I know – asked what the hell that was all about. I explained the situation, to their horror, and my good friend immediately withdrew her wedding invite. For someone suitably appalled and disgusted with her own behaviour, this troll couldn’t help herself. That very evening and the following day she was letting all her fellow Crazy trolls know who she’d met on Twitter and lapping up the fame. She was met with replies such as “Please tell me you gave her dog’s abuse”, “U shud have rag dolled the whore”, “Aw you got to hit her a massive slap”, “Do it, DO IT…”, “Buy her a drink, piss in it first”. If only her admiring trolls had seen her grovels. Sorry to burst that bubble. Even with a brewery full of alcohol in her she couldn’t muster up a bad word. The wedding went ahead and it was a wonderful day, both the brides were delighted. It was a better occasion for Ms Troll’s absence and my friend, a die-hard Rangers fan, made it clear she was unwelcome. My friend’s Canadian partner must be baffled by this culture but she has been on the receiving end of it herself – she was once racially abused in Glasgow, but only because the abusers thought she was Irish! And so that was my close encounter with a Rangers troll. As she left the hen night I can exclusively reveal that the look on her face was priceless. A brilliant but disturbing article Angela.I’m saddened and angered that you and others are put through this.As Phil Mac would say ‘Chapeau’…. It is a sad fact of life that the attitude of this particular troll is actually a great deal more common than you may wish to believe. In this part of the world, these attitudes are part of the culture of anti-Catholic bigotry and anti-Irish racism which has been allowed to grow and fester here over generations. It is beyond shameful. It represents a stain on our society, one which will take a very long time to die out. These problems continue to exist because bigotry is perpetuated by institutions such as the Orange Order where thousands of members waste their time preparing for worthless, pointless marches irrelevant to contemporary Scottish life. Despite what its members may say openly, these marches exist purely for the purpose of intimidating the Catholic community. These “traditions” are handed down to each successive generation to keep hate and division alive and flourishing in our towns and cities. It serves absolutely no useful purpose whatsoever to society. Keeping these “traditions” alive is a monumental waste of people’s time and prevents them from doing other things which could enhance and enrich their lives and be of value to their communities. Targeting an ethnic minority and singling them out to be the focus of a prolonged campaign of hatred over many generations is the very reason for these attitudes existing and this is what has given rise to these particular types of trolls. Websites such as Twitter and Youtube have given them a platform to express their vile bigotry while preserving their anonymity. They think that they cannot be traced so it gives them the confidence to abuse people in the most abhorrent manner possible. However some of them are being traced now and the more frequently this happens, the better it will be for everyone else. We don’t need this garbage in the 21st century. These attitudes should be consigned to the dustbin of history and the only way to achieve this is to talk about it openly, to acknowledge the problem and to NAME AND SHAME THOSE RESPONSIBLE FOR IT.